When it comes to Aligning on strategy, one of the key ways in which breakaway companies are different is that they have increased analytic investment with a focus on the last mile. See that? Breakaway companies spend nearly half their budget not on building the analytics they need, but on making sure those analytics get into the front line. Decision management is the best way to embed advanced analytics into your front-line systems and processes. Building decision services that encapsulate not just your analytic insight but the business rules and decision structure that turn predictions in recommendations and actions is a proven way to push analytics out into your organization. Moving on to Building the right foundations of data, technologies, and people, I was struck by the fact that breakaway analytics leaders were 2.5x more likely to have a clear methodology! And in particular that “companies with leading analytics programs not only focus on model development through their methodologies but also work to continuously maintain and upgrade models as part of a sophisticated model-management function”. 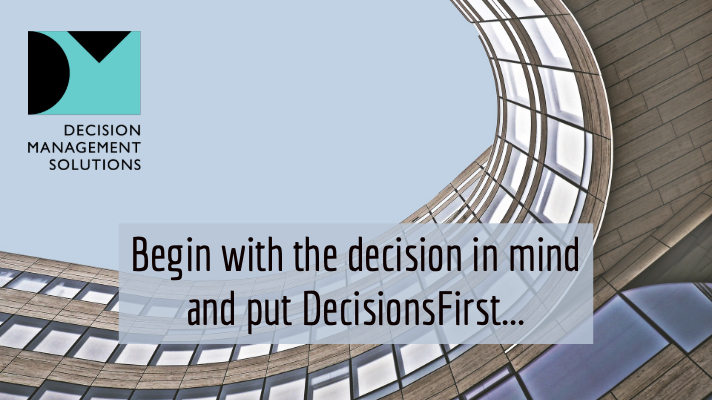 Our DecisionsFirst methodology, which we use on all our projects and license to our customers, explicitly includes decision analysis and continuous improvement in every solution. Not only thinking about analytic model management, but putting that model management into a context of decision performance management so you can improve your decision making and your business results. This is the first step in our DecisionsFirst approach – what we call “decisions first design thinking” – where we identify the critical decisions and develop a model of how the company would like to make that decision. This frames the requirements for analytics, ensuring that you build the right analytic models, know how you will use those analytics, and will be ready to get them into the last mile.